If you have a special request please contact me using the form on my homepage. Payment by Paypal only. Postage and packing charges will be added at cost. 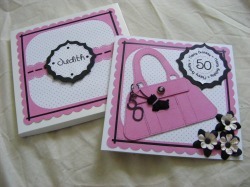 An 8 inch square card with matching gift box, personalised for the recipient. 8 inch square card with extra-deep matching box. Card uses the poem 'Warning' by Jenny Joseph to match the recipients birthday invitations. Wedding invitations and matching favour boxes created for a friend. 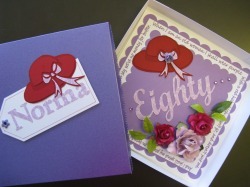 An 8 inch square card with matching gift box, personalised for the recipients.